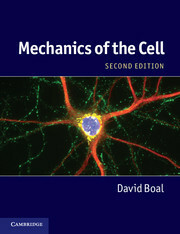 Exploring the mechanical features of biological cells, including their architecture and stability, this textbook is a pedagogical introduction to the interdisciplinary fields of cell mechanics and soft matter physics from both experimental and theoretical perspectives. This second edition has been greatly updated and expanded, with new chapters on complex filaments, the cell division cycle, the mechanisms of control and organization in the cell, and fluctuation phenomena. The textbook is now in full color which enhances the diagrams and allows the inclusion of new microscopy images. With around 280 end-of-chapter exercises exploring further applications, this textbook is ideal for advanced undergraduate and graduate students in physics and biomedical engineering. 1. Introduction to the cell, 2. Soft materials and fluids, Part I. Rods and Ropes: 3. Polymers, 4. Complex filaments, 5. Two-dimensional networks, 6. Three-dimensional networks, Part II. Membranes: 7. Biomembranes, 8. Membrane undulations, 9. Intermembrane and electrostatic forces, Part III. The Whole Cell: 10. Structure of the simplest cells, 11. Dynamic filaments, 12. Growth and division, 13. Signals and switches, Appendixes, Glossary, References, Index. David Boal is Professor Emeritus in the Department of Physics at Simon Fraser University, Canada. He has been working in the field of biophysics for the past twenty years and he now studies the mechanical issues in the origin of life.